SITE is the friendly software tool used by Pneuvay's service technicians. It is our way of ensuring you receive quick, efficient and reliable repair and maintenance services whenever and wherever you need it. SITE reminds us to contact you for your next equipment and system service. This prompts us to send you an email or call you, so you will never miss a service visit. 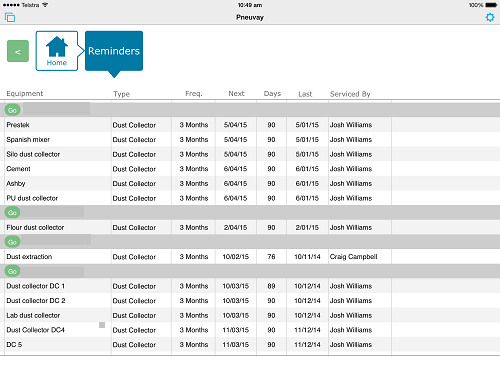 SITE ensures you will never miss your next scheduled equipment service. With SITE, you can now sign, send, and store documents electronically without the need to print or scan paper forms. This makes bill processing easier and faster. We ensure your equipment is thoroughly checked and maintained with our built-in repair and maintenance checklist. This is automatically saved and added to our database together with your previous service history for easy reference. Finding the information about your system and equipment is now quicker, easier and more convenient. 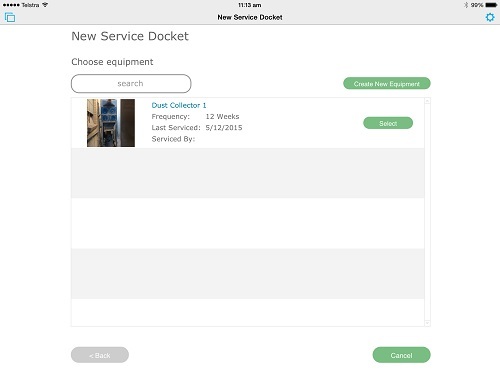 SITE has a built in electronic database that allows our service technicians to easily search information about your equipment, spare parts availability and other related data about it. SITE helps search for companies and equipment fast and efficiently. 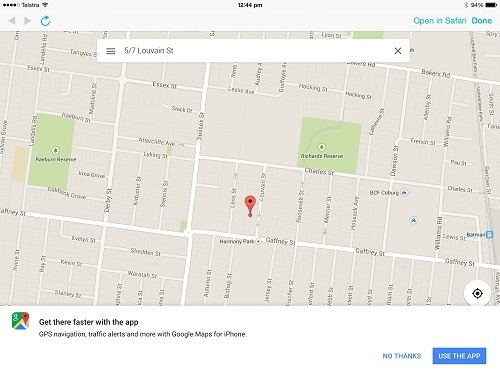 With a click of a button, the software links to maps that gives directions to your company. This means our service technicians can now be at your location quicker and easier than ever. SITE ensures our service technicians are bound to reach your destination quicker and easier than ever. Sometimes, your equipment damage may require further investigation. With SITE's easy photo capture system, our service technicians can easily capture photos of the damaged portion of your equipment and easily send it to you and our senior engineers for immediate action. 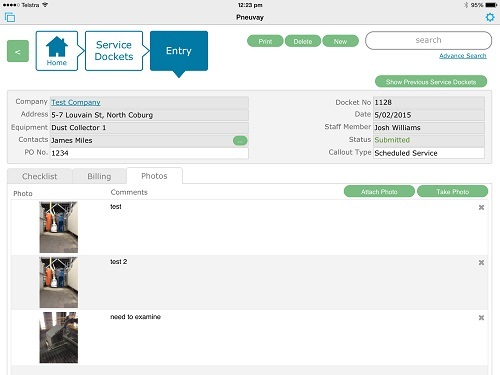 SITE saves photos of your equipment which can be sent to you and our engineers instantly. "Wow! we have come a long way from the days of writing the reports. Why did Pneuvay develop SITE? "Our technicians have been asking for a better system, the old service book was becoming antiquated. Customers also requested that they wanted electronic documentation. "We, being leaders in pneumatic conveying, material bulk handling, industrial dust collector and vacuum systems, wanted our business systems and processes to reflect that in all the services we deliver. "We wanted to improve our business performance and increase our staff’s productivity. This has now become a tool of the trade and is just as important as any of their other service tools. "We knew that we needed a customised system, one that would work the way we needed it to. It has been great, that we can keep improving it and changing it as our needs change. The system is evolving all the time. It is such an asset to have a job management tool that grows with you." How did it improve job efficiency? "It has been phenomenal. The staff say “it is the best thing that has happened to the service department in a long time.” The software is easy to use and gives them complete mobility in the field. "Our technicians click on the company name and all the details, are there in front of them, contacts, address, previous service history, photos, notes etc. They walk in armed with all the information they need. 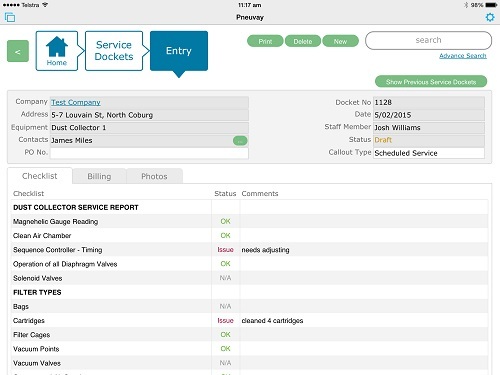 "There are no lost service dockets/reports, which has stopped delays in invoicing. Streamlining this work process has really enhanced and improved everyone's productivity." What was your customers' feedback? "Our customers are loving the new software. We have had very positive feedback. They are impressed with the ease of use, its simplicity and the fact they can have their report instantly and electronically. Our service technicians can show them photos and discuss the issue then and there." How do you see SITE 5 years from now? "Pneuvay will continue to refine and develop SITE. It will evolve over time for it remain relevant for the technicians and company’s needs." "As a business we strive to meet our customer’s needs and exceed their expectations. We are leaders in the industry and plan to remain at the top. We are always looking at how we can improve and responding to customer’s requests." Click here to learn more about the repair and maintenance services delivered by Pneuvay Engineering. It's surprising how many companies in this day and age, with all the amazing technology available at our fingertips, continue to use manual and inefficient out-dated methods to run their business. Its unproductive for staff, unprofitable for the business and unprofessional in the eyes of their customers. That’s where Hi-Voltage shine. Hi-Voltage helps businesses boost productivity, streamline their workflow and provide them a strong competitive edge by working closely with companies to develop the perfect software solution, whether it be a custom database system, an iPad mobile solution or a web based application. Visit Hi-Voltage today to see how they can help you significantly improve your business.